Stringent requirements for fire and acoustic performance were the principal drivers for a multi-million pound public service and leisure hub in the centre of Wigan, leading to the specification of LIG company products throughout. 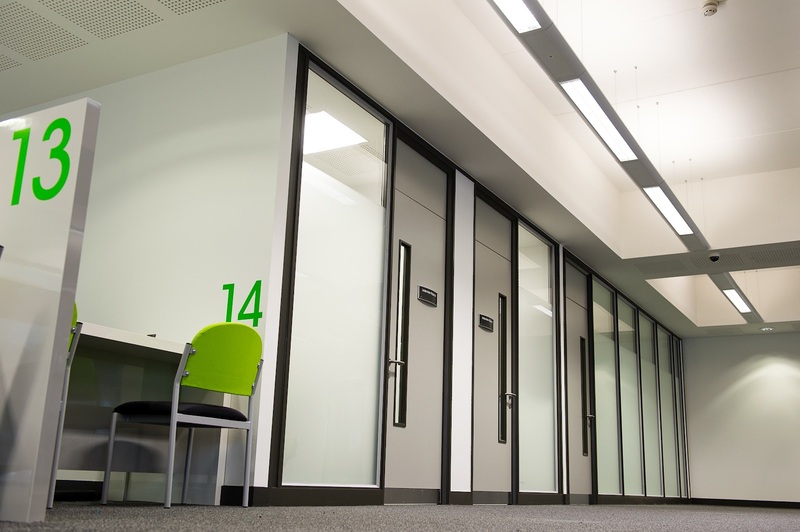 Following discussions with architects LCE / AStudio, main contractor Morgan Sindall and sub-contractor Parpac, Komfort Workspace’s partitioning systems and Laidlaw Solutions’ handrail & balustrading, and doorsets and ironmongery were specified for The Life Centre in Wigan. Komfort’s Technical Specification Manager Andrea Glenister worked closely with all parties to meet the spec throughout both sites, which sit on either side of Wigan Town Hall. 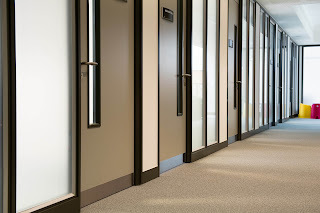 The agreed solution was to use Komfort’s Komfire 75, Komfire 100 and Polar with Trojan sliding doors. 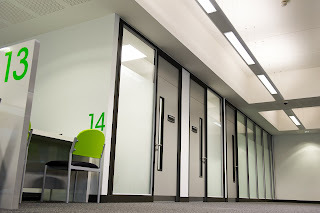 However, the amount of glazing on site, and the fact that it had to be hand manoeuvred into position on each floor of both buildings meant that health and safety was a major consideration and advisors were heavily involved on site. The south site features a Healthy Living Zone with gym, swimming pool and fitness studio as well as health and wellbeing services, whilst the north contains a neighbourhood zone, library, soft play area and a one-stop shop for public services. Similarly, Laidlaw’s role in the project required a bespoke approach for the handrails and balustrades, and doorsets and ironmongery throughout both the north and south buildings. Laidlaw had worked for Morgan Sindall and the architects on a previous project and attended many meetings before the order was placed, with the design managers and architects paying attention to design detail and scope of works. On special request from the architect, all the doorsets were supplied fully painted and as much work was done offsite as possible in order to retain as much control over the finished appearance as possible. The mortice locks for the doors were also factory-fitted and were delivered on site ready to be installed. Aside from the design, this approach also ensured compliance for fire and acoustic certification. On top this, Laidlaw also had to supply fully post-formed doors for the swimming pool area and provide ironmongery that was resistant to both the effects of both moisture and chlorine. Visit www.laidlaw.net for product information.